I’m a 90/10 kind of girl…I go 90% hard and 10% notsohard when it comes to my food lifestyle. I like to use the word lifestyle, because sometimes diets can be taken to an extreme and aren’t necessarily healthy. Plus, I want to make good food choices for the sake of my body, not just my weight (which, let’s talk about it, my body just seems to instantly transform a Sunday Funday boozy brunch into an increased booty. *shakes fist at the sky! Thanks for nothing, metabolism!) My 90/10 lifestyle is 90 vegan/veggie/10 fish and also 90/10 when it comes to sugar, gluten, and the like. That’s the balance I’ve found that works for me, and frankly it’s probably made up because who has time for statistics at this point? I sure don’t. My husband, who follows no such stats, has radically altered his meat eating ways since being married to a hippie-dippie earth lover. In part, it’s because I make his meals, but it’s also because he has listened to research about how plant eating diets produce much healthier people. Still. I feel like it’s a mini-triumph for vegetarians everywhere that my Texan steak lovin’ red meat eatin’ super buff husband loves himself a green smoothie. With plant based protein powder! WHAT! World peace can happen! When I make meals, I often do a vegetarian/vegan version for me and a pescetarian version for him. It’s the His and Her version of dinner. Or supper for you southerners out there. 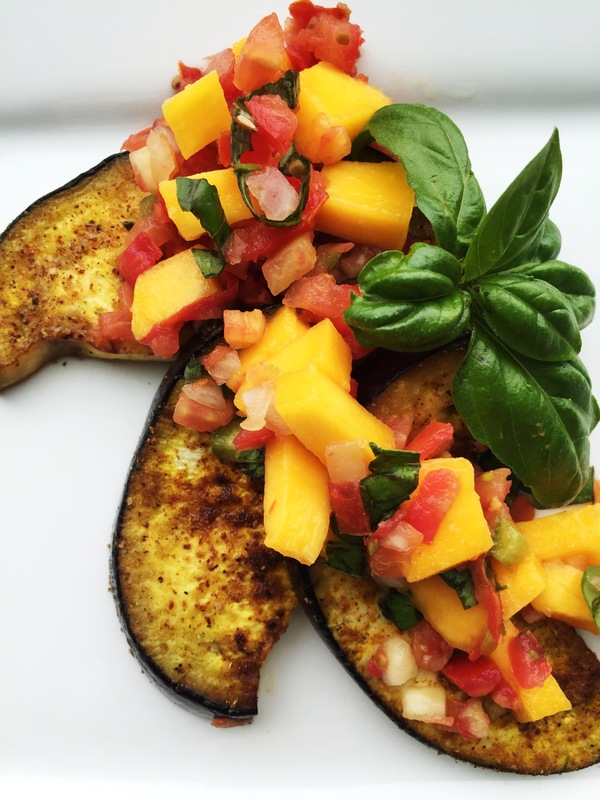 A nice little summery meal I made today was Mango Salsa Eggplant (fish for my sweet husband). This is a pretty quick little meal that is bursting with flavors. I don’t know about you, but I just love mangoes! I doubt I would dislike anything that had them in a recipe, but even my husband concurred with me on this one. For a flavor panel, it’s a wide range of spicy, tangy and sweet, and it works perfectly with a nice piece of white fish like halibut or tilapia, or eggplant for the vegetarian. TIP: have an amazing fish recipe? Sub out the fish and replace with eggplants! 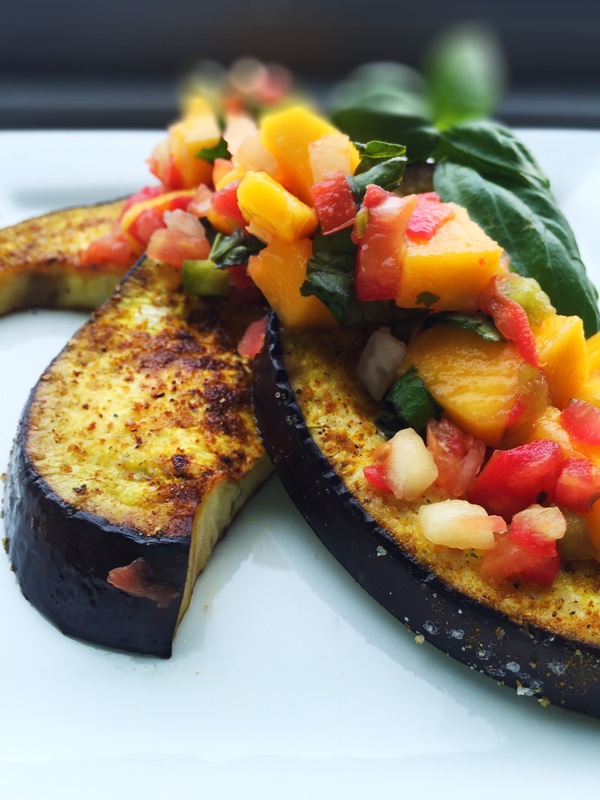 Eggplants absorb flavors well and make a good replacement for white meats. The key is in the seasoning. You want to create a good contrast, because a nice fresh fish or eggplant is pretty bland on its own, so it is the perfect playground for spices and other flavors to play. Prepare your eggplant/or fish face side first: (this is the side you lay down in the pan first away from you once the oils are hot). In a food processor, chop salsa ingredients, excluding basil and mango. Be careful not to puree. You can also dice the ingredients by hand if you prefer a chunkier consistency. Dice mango into small cubes. Stack basil leaves and roll, then dice into ribbons. Toss into finished salsa with the mango, combine all ingredients. 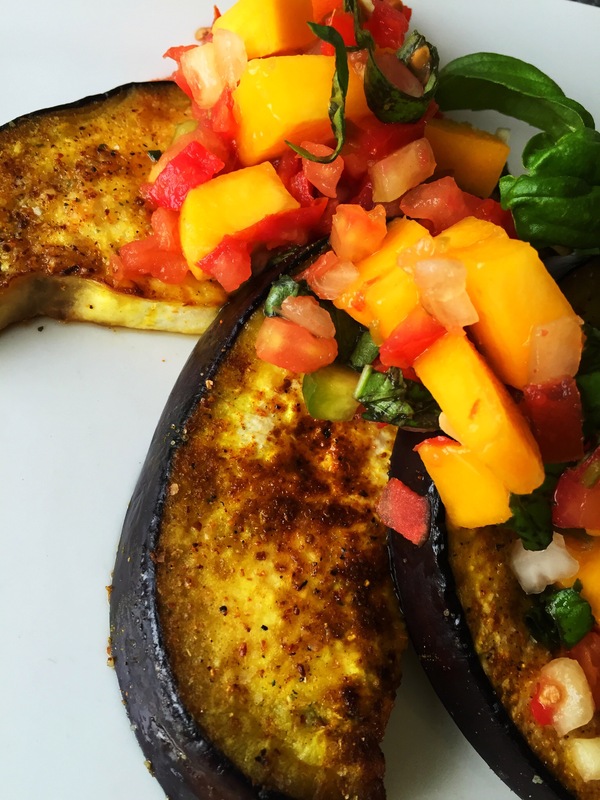 Melt a butter and coconut oil in med-high pan; lay eggplant (or fish) away from you and allow eggplant to get a nice seer on both sides (about 3-5 min per side). The butter adds a nice rich flavor to the eggplant. Once finished, cover eggplant with salsa.